Easy Mango Chocolate Nut Delight is the ultimate dessert to serve guests and family. This is made by layering chocolate chip cookies, cheese, cream and mango mixture; topped with almonds and chocolate. I love mango so I have some tasty collection of mango desserts. 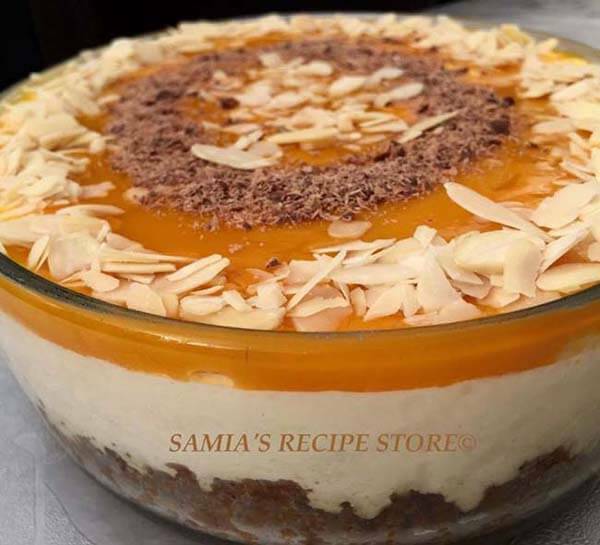 If you have short time and want to make a delicious dessert then try out How to Make Aamras – Easy Mango Dip, if you are not time problem then I will must say to entertain with Easy Mango Dessert. Crush the chocolate chip cookies by either breaking with a rolling pin in a zip lock bag or blitz in a grinder. In a dish combine the crushed cookies and melted butter and mix well - we are after a sand type consistency. Place in the serving dish and press down to even the surface. Place in fridge for 1 hour or 10-20 minutes in the freezer. In a bowl add cheese and icing sugar and whip till soft and combined. In a separate bowl add the cream and whip till get stiff peaks. Fold the cream into the cheese – do NOT be tempted to mix or whip it or it will turn to liquid. Remove biscuit base and top with the cream mixture and even out the surface. Place in fridge to set for at least 4-6 hours. Add gelatine to the mango pulp and mix well. Top the cheese layer with the mango mixture and even out. Leave in fridge to set – overnight works best. Just before serving remove from fridge, top with flaked almonds and chocolate.